Enterprise Evolver (“Evolver”) is a comprehensive browser /mobile application that allows organizations to map the whole enterprise so that the decision makers of an enterprise who come up with new strategies and transformation initiatives can make wise decision to execute their strategic plans. In an enterprise you have different business parts like market (e.g.customers, products & services, organization touchpoints), strategy & motivation (e.g. drivers, vision, mission, goal, measure, metrics, policies and standard), business (e.g. business capability, Business process, organization units, people) and technology (e.g. business information, application, application services, network, devices). The Evolver can be used to capture different but interrelated business parts (aka structures) of your business representing the whole (e.g. the big picture), conceptual blueprints and target operating model of the business at any given point in time. What is the Enterprise Evolver platform? The web version of Enterprise Evolver (“Evolver”) can be accessed from any browser and device. The mobile version runs only on iPad tablet. Both of these products have different features. How do I generate Insight? The Insight Analyzer feature provides many functionalities for users to visualize and analyze enterprise complex data and relationship through interactive directed network graph (“graph”). Graphs generated through the Insight Analyzer provides the full glimpse if enterprise reality and architecture continuum. The graph can be used to perform many different kind of structural analysis to uncover emergent patterns that are only visible when all business parts/relations are displayed. Simply select the business categories (aka business parts – Goals, Capability, Application, People, Business Information etc) from the Insight Analyzer main menu and generate the graph. The Insight Analyzer automatically gathers all the relationship and flow information and generate network graphs consists of a set of nodes and edges. Nodes represent the business parts and edges are the connections that represent links and dependency between the business parts.Network graphs can also be turned into layered view or radial view providing you many graphs type to analyze your particular situation. Does Evolver support Meta Modeling? Yes. The system editor screen is used to manage an organization’s business parts or structure’s groups and categories. This screens offers an easy and intuitive way to configure the meta model. You can create a unique meta model for your own unique needs. The meta model describes the meaning of core concepts (e.g. business parts) , defines the structure of the concept and specifies the necessary definition of each part needed to communicate it consistently. What is the Time Machine? 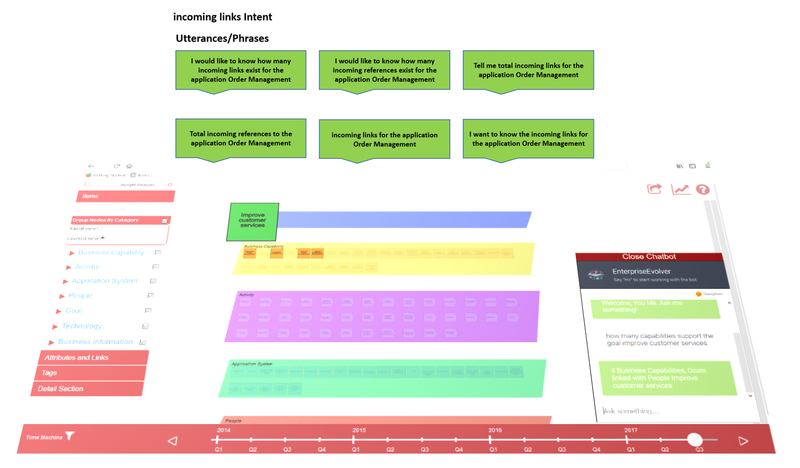 To visualize the complex relationship data over time, the Insight Analyzer offers a time machine feature. 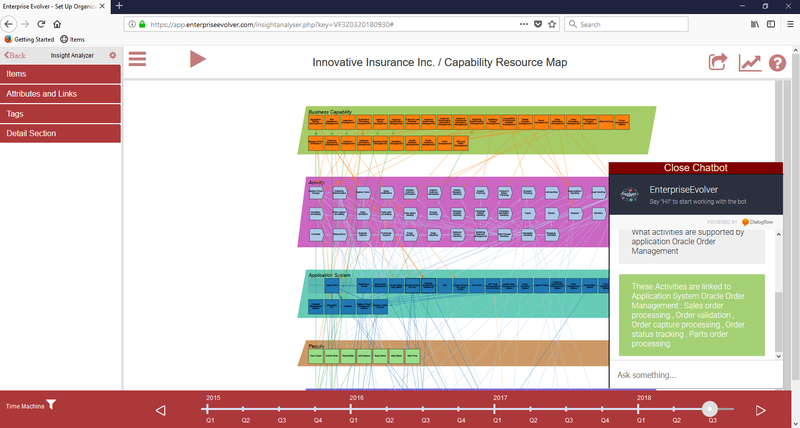 This feature allows users to visualize the evolution of enterprise in terms of how nodes and connections change over time. For example, users can visualize how business capabilities are evolving as the IT architecture is modernized to support capability evolution. You can visualize what resource and connection are acquired or retired at a given point in time. This function can also be used to depict the future state of the business or to depict a solution blueprint over time. 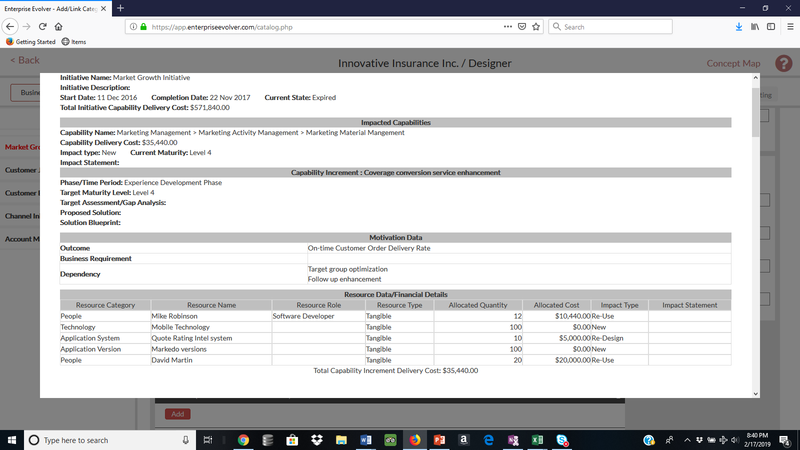 Can I import my business components and categories? Yes. The Evolver provides import utility for MS excel. Download the excel template and enter your data and import the file. The Evolver takes care of importing data in cloud db. Can I Collaborate in realtime? Yes. The Evolver offers near realtime and asynchronous collaboration to keep everyone on the same page. Admin users, modelers and end users can all collaborate from one central place. How do I access web app? After your purchase the subscription, you get an email with all the information to access the Evolver app over the web from any browser. Yes. You can upgrade or cancel the plan from the account page at anytime. Currently we accept Visa, MasterCard, Discover, Diners Club and American Express. We do not accept PayPal.